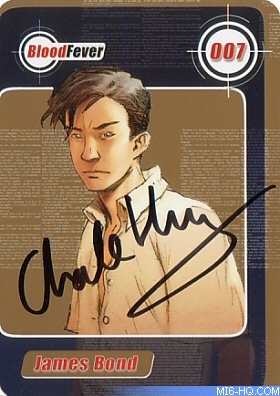 Lucky MI6 readers can win a complete set of Young Bond collectors cards exclusively signed by author Charlie Higson. Thanks to Puffin and author Charlie Higson, MI6 can bring you a great competition to win a complete set of exclusively signed Young Bond collectors cards. When the second Young Bond title was released in the UK, book chain Waterstones offered an exclusive pack of collectors cards in copies of the novel. The silver packets contained 5 random cards which could be traded with other readers, each with a character design by artist Kev Walker and a quote from the book on the reverse. The full set consists of six standard cards and a special limited edition #007 card featuring Young Bond. 10,000 copies of the book contained the card packs in Waterstones, but only 2,000 contained the special #007 card. 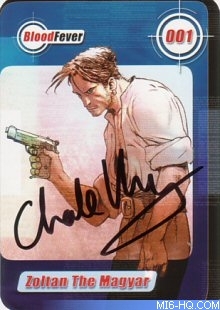 Above: The rare 007 card signed by author Charlie Higson. Signed Young Bond Collectors Cards Must Be Won! MI6 has a complete set of Young Bond collectors cards exclusively signed by author Charlie Higson to give away to a lucky reader. What was the name of the main villain in the first Young Bond book SilverFin? The competition closes at midnight GMT on 9th September 2006. MI6 will choose the winners at random from the correct answers received.